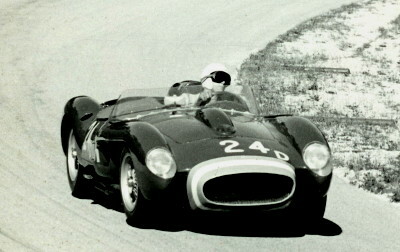 1950s racer George Keck shares his photos & memories of owning the car now owned & raced by David Love. "Hopefully this will fill the pot hole (or gap, if you will) that appears in 0754's racing history trail during my time at bat. First... allow me to digress a moment and provide some background that (interestingly enough) provides insight from a humanistic standpoint. In '58, an issue of the Fuller Brush catalogue was devoted to Ferraris and Phil Hill with story line provided by Denise McCluggage (and assuredly... some space begrudgingly allocated to brushes, as Fuller was a devout Ferrari aficionado). 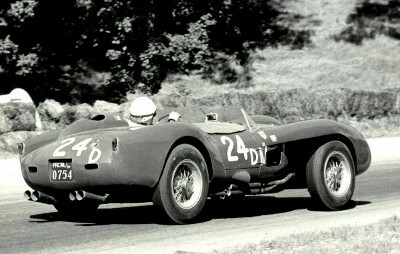 Page 28 contained a picture of a Ferrari 250TR that I showed to any and all (who would look or listen) as the type I felt the most aggressive looking yet (the one you wouldn't like to meet in a dark alley, if you will)... the Ferrari model I'd love to own. More background... In the '50s Czechoslovakian uprising, a group of Czech's commandeered a C-47 escaping to the western free world (a story in itself)... among them (as acknowledged by 83 yr old Jaroslav Juhan from Prague) were Pilot Mira Slovak (eventually to become driver of Bill Boeing Jr's hydro "Miss Wahoo"), himself (then a champion NSU motor cycle rider), his brother Frank (also into motorcycle racing), and Vasek Polak (who soon after became a racing mechanic with Rolf Weutherich for John von Neumann... inci- dentally, from whom I picked up Kunstle's Sebring RS for eventual resurrection as the "RSKeck" in '58). I knew of only Mira, Vasek, and Rolf at the time. Yet a little more background... In late spring of '59 Frank (Becker) and I were sitting on his Mercer Island front porch enjoying the view and having a few beers. I happened to pick up the Seattle Times and scanned the ads. Lo and behold! there was a two line Ferrari ad in the automobile section that I turned and read to Frank. The ad simply said... 1958 Ferrari 250 Testa Rosa $7,500 giving a phone number... (in the Seattle Times? give me a break!). Frank reached over and handed me the phone (we hadn't that many beers to pass up my making the call). Still some more... The number called turned out to be the Vancouver (Canada) residence of Frank Juhan (Vancouver's then Jag dealer, as I recall). He stated the car belonged to his brother Jaroslav who resided in Guatemala at the time. He indicated that Jaroslav last drove at LeMans (where it collided... Picard at the wheel...with Jay Chamberlain's Lotus early on, spending the rest of the race with the Lotus 15 under the Dunlop Bridge). Where it was consigned to Vasek Polak in Redondo Beach, and that I could see it there (wow!...a legit ad for a 250TR and in the hands of someone I knew of). Needless to say... I told Frank Juhan to consider her sold and set about contacting Vasek.